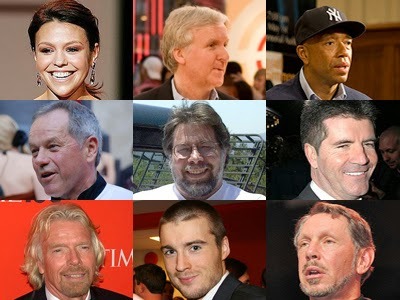 We have compiled a list of 100 amazing “degreeless” entrepreneurs who have risen to the top. Some high-profile entrepreneurs you will recognize immediately, while others you may be discovering for the first time. Many of them didn’t complete elementary school, and still more are considered high school dropouts. Their backgrounds and industries run the gamut. However, they all have at least two things in common: incredible success and no college degree. My brother, Matthew, and I aren’t on this list (didn’t want to toot our own horns… well, at least not too loudly); however we count ourselves among the golden many who achieved success without attending college. Entrepreneurs at an early age, Matthew and I had already started six (toot toot) businesses by the time we graduated high school. We were both offered college scholarships, but turned them down – it was clear to us that college was not in our future. Within a week of graduating high school, we bought a bar/café/billiards location, which we overhauled, re-branded, and turned into a hot spot; and on the 12-month we sold it for a great profit. Of course, we have gone on to start several more businesses, both offline and online, and we have never once looked back. While we’ve listed our Top 100, we know there are hundreds (if not thousands) more entrepreneurs who have achieved success without a college a degree. Are you one of them? Let us know who we forgot by posting your comments below. Abraham Lincoln, lawyer, U.S. president. Finished one year of formal schooling, self-taught himself trigonometry, and read Blackstone on his own to become a lawyer. Amadeo Peter Giannini, multimillionaire founder of Bank of America. Dropped out of high school. Andrew Jackson, U.S. president, general, attorney, judge, congressman. Home-schooled. Became a practicing attorney by the age of 35 – without a formal education. Andrew Perlman, co-founder of GreatPoint. Dropped out of Washington University to start Cignal Global Communications, an Internet communications company, when he was only 19. Anne Beiler, multimillionaire co-founder of Auntie Anne’s Pretzels. Dropped out of high school. Ansel Adams, world-famous photographer. Dropped out of high school. Ashley Qualls, founder of Whateverlife.com, left high school at the age of 15 to devote herself to building her website business. She was more than a million dollars by 17. Barbara Lynch, chef, owner of a group of restaurants, worth over $10 million, in Boston. Dropped out of high school. Ben Kaufman, 21-year-old serial entrepreneur, founder of Kluster. Dropped out of college in his freshman year. Benjamin Franklin, inventor, scientist, author, entrepreneur. Primarily home-schooled. Billy Joe (Red) McCombs, billionaire, founder of Clear Channel media, real estate investor. Dropped out of law school to sell cars in 1950. Bob Proctor, motivational speaker, bestselling author, and co-founder of Life Success Publishing. Attended two months of high school. Bram Cohen, BitTorrent developer. Attended State University of New York at Buffalo for a year. Carl Lindner, billionaire investor, founder of United Dairy Farmers. Dropped out of high school at the age of 14. Charles Culpeper, owner and CEO of Coca Cola. Dropped out of high school. Coco Chanel, founder of fashion brand Chanel. A perfume bearing her name, Chanel No. 5 kept her name famous. Colonel Harlan Sanders, founder of Kentucky Fried Chicken (KFC). Dropped out of elementary school, later earned law degree by correspondence. Craig McCaw, billionaire founder of McCaw Cellular. Did not complete college. Dave Thomas, billionaire founder of Wendy’s. Dropped out of high school at 15. David Geffen, billionaire founder of Geffen Records and co-founder of DreamWorks. Dropped out of college after completing one year. David Green, billionaire founder of Hobby Lobby. Started the Hobby Lobby chain with only $600. High school graduate. David Karp, founder of Tumblr. Dropped out of school at 15, then home schooled. Did not attend college. David Neeleman, founder of Jet Blue airlines. Dropped out of college after three years. David Ogilvy, advertising executive and copywriter . Was expelled from Oxford University at the age of 20. David Oreck, multimillionaire founder of The Oreck Corporation. Quit college to enlist in the Army Air Corps. Debbi Fields, founder of Mrs. Fields Chocolate Chippery. Later renamed, franchised, then sold Mrs. Field’s Cookies. DeWitt Wallace, founder and publisher of Reader’s Digest. Dropped out of college after one year. Went back, then dropped out again after the second year. Dov Charney, founder of American Apparel. Started the company in high school, and never attended college. Dustin Moskovitz, multi-millionaire co-founder of Facebook. Harvard dropout. Frederick Henry Royce, auto designer, multimillionaire co-founder of Rolls-Royce. Dropped out of elementary school. George Eastman, multimillionaire inventor, Kodak founder. Dropped out of high school. George Naddaff, founder of UFood Grill and Boston Chicken. Did not attend college. Gurbaksh Chahal, multimillionaire founder of BlueLithium and Click Again. Dropped out at 16, when he founded Click Again. H. Wayne Huizenga, founder of WMX garbage company, helped build Blockbuster video chain. Joined the Army out of high school, and later went to college only to drop out during his first year. Henry J. Kaiser, multimillionaire & founder of Kaiser Aluminum. Dropped out of high school. Hyman Golden, co-founder of Snapple. Dropped out of high school. Ingvar Kamprad, founder of IKEA, one of the richest people in the world, dyslexic. Isaac Merrit Singer, sewing machine inventor, founder of Singer. Elementary school dropout. Jack Crawford Taylor, founder of Enterprise Rent-a-Car. Dropped out of college to become a WWII fighter pilot in the Navy. Jake Nickell, co-founder and CEO of Threadless.com. Did not graduate from college. James Cameron, Oscar-winning director, screenwriter, and producer. Dropped out of college. Jay Van Andel, billionaire co-founder of Amway. Never attended college. Jeffrey Kalmikoff, co-founder and chief creative officer of Threadless.com. Did not graduate from college. Jerry Yang, co-founder of Yahoo! Dropped out of PhD program. Jimmy Dean, multimillionaire founder of Jimmy Dean Foods. Dropped out of high school at 16. John D. Rockefeller Sr., billionaire founder of Standard Oil. Dropped out of high school just two months before graduating, though later took some courses at a local business school. John Mackey, founder of Whole Foods. Enrolled and dropped out college six times. John Paul DeJoria, billionaire co-founder of John Paul Mitchell Systems, founder of Patron Spirits tequilla. Joined the Navy after high school. Joyce C. Hall, founder of Hallmark. Started selling greeting cards at the age of 18. Did not attend college. Kemmons Wilson, multimillionaire, founder of Holiday Inn. High school dropout. Kenneth Hendricks, billionaire founder of ABC Supply. High school dropout. Kenny Johnson, founder of Dial-A-Waiter restaurant delivery. College dropout. Kevin Rose, founder of Digg.com. Dropped out of college during his second year. Kirk Kerkorian, billionaire investor, owner of Mandalay Bay and Mirage Resorts, and MGM movie studio. Dropped out eighth-grade. Larry Ellison, billionaire co-founder of Oracle software company. Dropped out of two different colleges. Leandro Rizzuto, billionaire founder of Conair. Dropped out of college. Started Conair with $100 and hot-air hair roller invention. Marc Rich, commodities investor, billionaire. Founder of Marc Rich & Co. Did not finish college. Marcus Loew, multimillionaire founder of Loews theaters, co-founder of MGM movie studio. Elementary school dropout. Mark Ecko, founder of Mark Ecko Enterprises. Dropped out of college. Mary Kay Ash, founder of Mary Kay Inc. Did not attend college. Michael Dell, billionaire founder of Dell Computers, which started out of his college dorm room. Dropped out of college. Michael Rubin, founder of Global Sports. Dropped out of college in his first year. Micky Jagtiani, billionaire retailer, Landmark International. Dropped out of accounting school. Milton Hershey, founder of Hershey’s Milk Chocolate. 4th grade education. Philip Green, Topshop billionaire retail mogul. Dropped out of high school. Rachael Ray, Food Network cooking show star, food industry entrepreneur, with no formal culinary arts training. Never attended college. Ray Kroc, founder of McDonald’s. Dropped out of high school. Branson, billionaire founder of Virgin Records, Virgin Atlantic Airways, Virgin Mobile, and more. Dropped out of high school at 16. Richard DeVos, co-founder of Amway. Served in the Army and did not attend college. Schulze, Best Buy founder. Did not attend college. Rob Kalin, founder of Etsy. Flunked out of high school, enrolled in art school for a time, faked a student ID at MIT so he could take classes. His professors subsequently helped him get into NYU, they were so impressed. Ron Popeil, multimillionaire founder of Ronco, inventor, producer, infomercial star. Did not finish college. Rush Limbaugh, multi-millionaire media mogul, radio talk show host. Dropped out of college. Russell Simmons, co-founder of Def Jam records, founder of Russell Simmons Music Group, Phat Farm fashions, bestselling author. Did not finish college. S. Daniel Abraham, founder of Slim-Fast, billionaire. Did not attend college. Sean John Combs, entertainer, producer, fashion designer, and entrepreneur. Never finished college. Fanning, developer of Napster. Dropped out of college at the age of 19. Simon Cowell, TV producer, music judge, American Idol, The X Factor, and Britain’s Got Talent. High school dropout. Steve Madden, shoe designer. Dropped out of college. Steve Wozniak, co-founder of Apple, billionaire. Did not complete college. Ted Murphy, founder of social media company Izea Entertainment. Dropped out of college. Theodore Waitt, billionaire founder of Gateway Computers. Dropped out of college to start Gateway – one semester before graduating. Thomas Edison, inventor of the light bulb, phonograph, and more. Primarily home-schooled, then joined the railroad when he was only 12. Tom Anderson, co-founder and “friend” of MySpace. Dropped out of high school. Ty Warner, billionaire developer of Beanie Babies, real estate investor, and hotel owner. Dropped out of college. Vidal Sassoon, founder of Vidal Sassoon, multimillionaire. Dropped out of high school. W. Clement Stone, multimillionaire insurance man, author, founder of Success magazine. Dropped out of elementary school. Later attended high school, graduating. Attended but did not finish college. W.T. Grant, founder of W.T. Grant department stores, multimillionaire. Dropped out of high school. Amos cookies. Left high school at 17 to join the Air Force. Walt Disney, founder of the Walt Disney Company. Dropped out of high school at 16. Wolfgang Puck, chef, owner of 16 restaurants and 80 bistros. Quit school at the age of 14. Y.C. Wang, billionaire founder of Formosa Plastics. Did not attend high school.